Once again my blog is falling behind, but have no fear, we're still traveling, living full time in our motorhome and loving this adventure we're on. 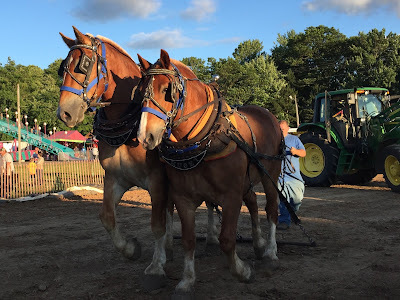 I plan to go back and post a few blogs from our time after San Diego to present here in WI. Those travels included time in Yosemite, Sequoia Nat Park and the Owens Valley in northern CA. We spent a week in Bishop and attended Mule Days. Explored ghost towns and found some great hikes. These were amazing travels. My brother in law checking his corn back in July. Now in Sept it is well over our heads. The crops look very good this fall. Maybe too good, we hear corn prices are down. Camping at the home farm. My sister and brother in law always offer us a spot to camp at the farm. They have switched to crop farming...the cows are gone and the old barn sits empty. Sad to see the small dairy farms becoming a thing of the past. DOOR COUNTY, one of the most beautiful places in WI. 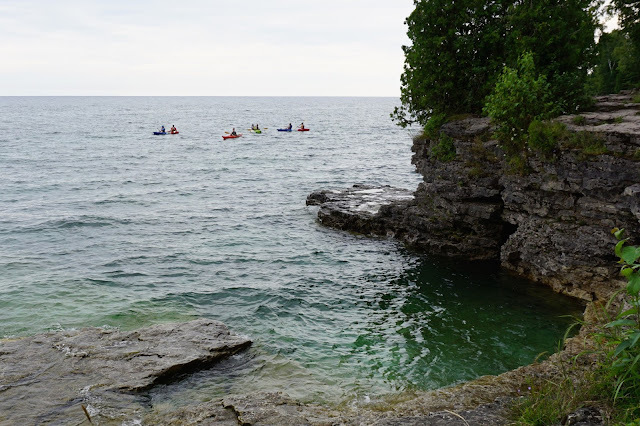 Cave Point County Park on the Michigan Shoreline has beautifully colored turquoise water. The caves in the limestone cliffs make it a popular spot for kayaking. 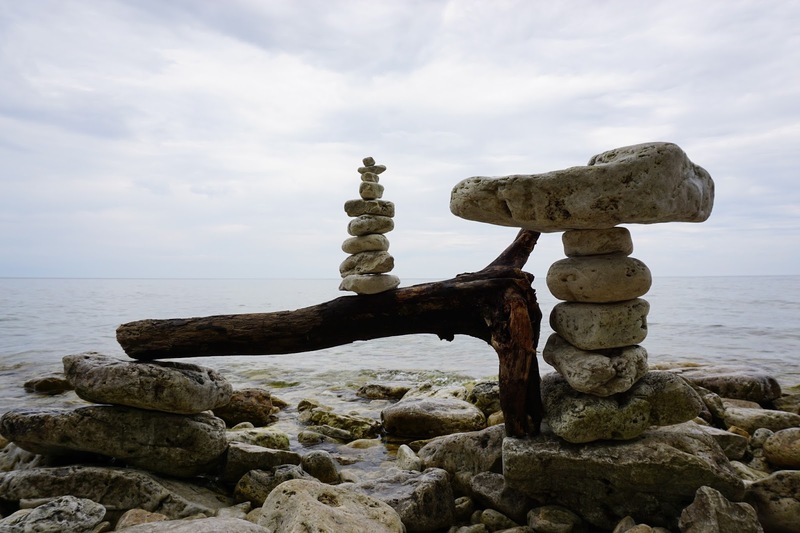 PEACEFUL....my favorite cairn along the Cave Point shoreline. DULUTH MN, Canal Park is a great place to watch ships come into port. The Indiana Harbor is a 1,000 foot long ship, one of the longest on the Great Lakes. As a thunderstorm was brewing, this dramatic sky unfolded. WI is known for small town festivals, horse pulls and tractor pulls. Being die hard Packer fans, a trip to Green Bay was in order. 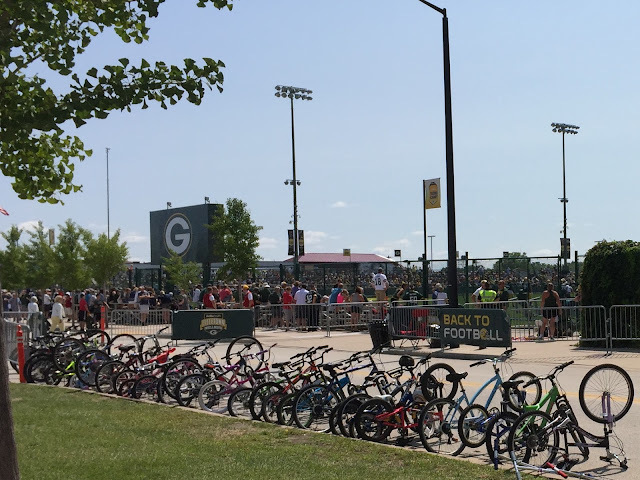 The Packer's open practices are popular and draw a huge crowd. 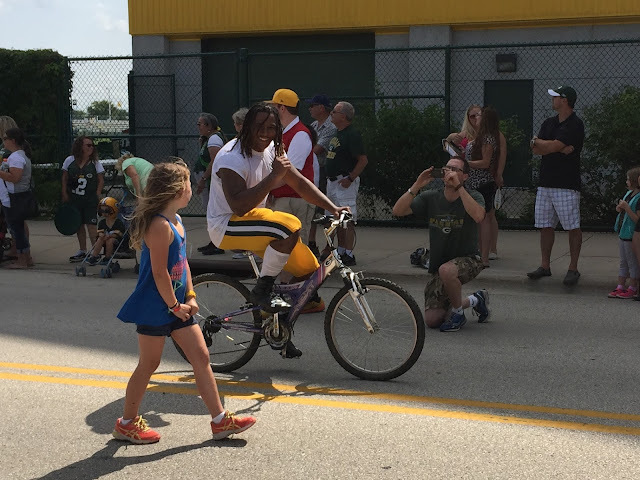 A favorite tradition is the players riding kids bikes back and forth from the stadium to the practice field. Bikes are lined up waiting for the end of practice. As practice ends, kids stand by their bikes and hope to be chosen. Said to be the world's largest scrap metal sculpture...standing amid a collection of sculptures in the middle of WI. 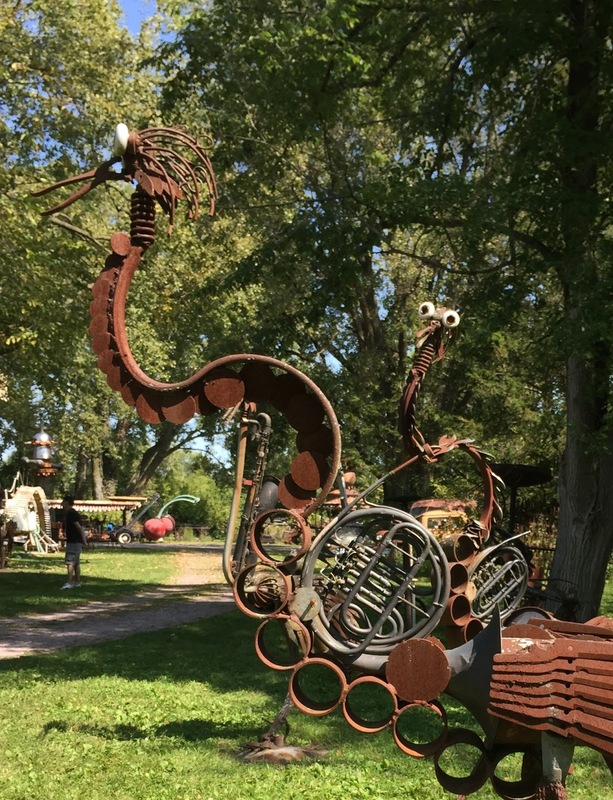 We enjoy the unusual, and this sculpture garden fit the bill. Tom Every worked as an industrial wrecker taking down old factories and buildings. He retired in 1983 and decided to create from what was considered trash. 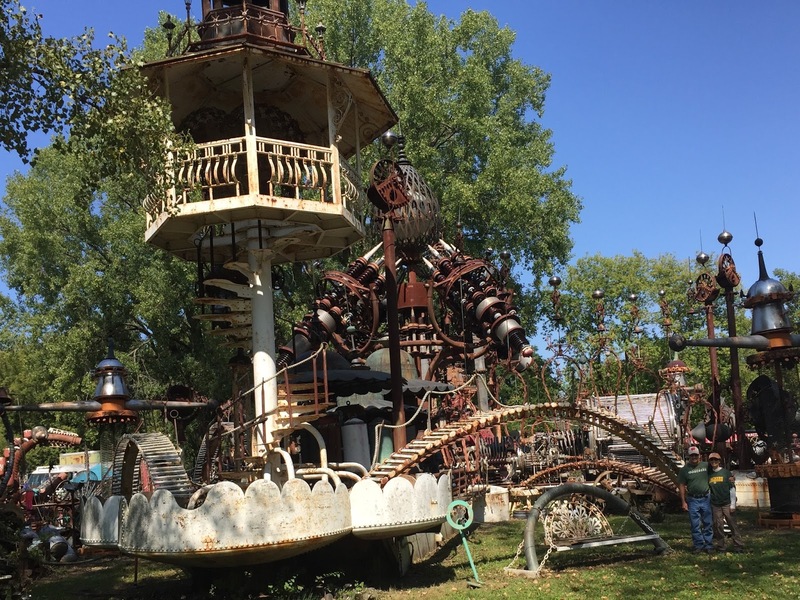 He earned the nickname Dr. Evermor and named this massive sculpture the Forevertron. One could spend hours looking at all the different pieces incorporated into his art. There is a full orchestra of creatures with different instruments. Tha's all for now, will be heading southward soon, fall weather is setting in.